To witness the natural and architectural treasure troves of south India, one of the most exciting and luxurious alternative is to travel on board Golden Chariot train. Golden Chariot is a joint venture between Karnataka State Tourism and Development Corporation (KSTDC) and the Indian Railways, the Golden Chariot derives its name from the famous stone in Hampi. Golden Chariot has two tastefully crafted itineraries of this luxury tourist train – namely Pride of the South and Splendors of the South – unravels the mystifying hues of southern region of India. Pride of the South travel through Karnataka and covers the destinations like Bangalore, Kabini , Bandipur, Mysore, Hassan, Hampi and Badami and Goa while the Splendors of the South travel through the temple towns of Tamil Nadu and backwaters of Kerala along with destinations in Karnataka. Coaches of this deluxe train are furnished with antique furniture which is inspired from the cultural ethos of erstwhile south Indian dynasties. To maintain the royal élan of the train journey, all the coaches have been named after erstwhile princely states of the south namely Kadamba, Hoyasala, Rastrakota, Ganga, Chalukya, Bhahamani, Adilshahi, Sangama, Shathavashna, Yudukula and Vijayanagar. There are a total of 26 twin bed cabins, 17 double bed cabins and 1 cabin for the physically challenged. All the cabins of Golden Chariot are outfitted with facilities like LCD television, air conditioning, Wi-Fi internet and a private bathroom to provide cozy comforts to the guests. Other facilities and services provided on board include two ornately designed restaurants, lounge bar, business center, gymnasium and a wellness spa. An array of gourmet delicacies are tastefully served in the lavish premises of the two in-house restaurants called Nala and Ruchi respectively. 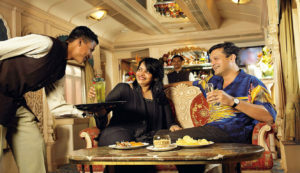 There is a lounge bar called Madira where guests can unwind and interact with fellow travelers over a glass of wine. This is not the end of the road for the Golden Chariot facilities. 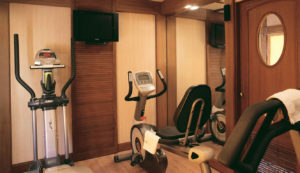 There is a fully equipped gymnasium and an Ayurvedic spa Nirvana that allows the guests to tab on their fitness routine even while holidaying. There is a business center for those guests who cannot make out time for holidays out of their hectic business schedule. 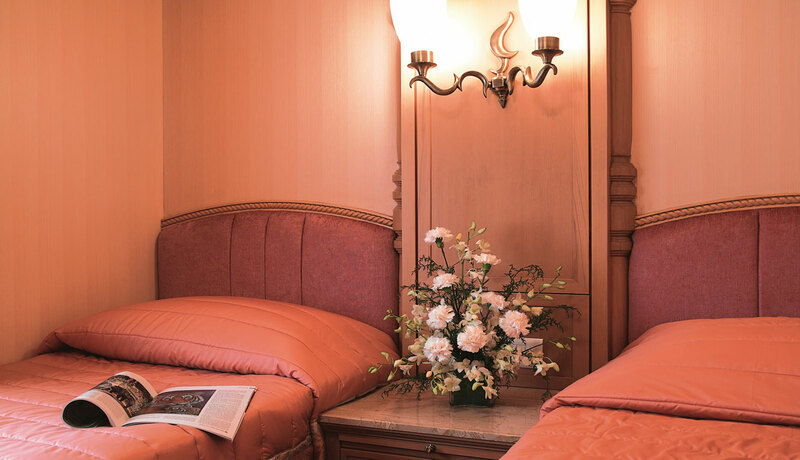 A Midas touch of heritage, royalty and cultural ethos is manifest in the interiors of Golden Chariot train. With its name itself drawing inspiration from stone chariots in Hampi, the train is a picture perfect replica of erstwhile south Indian heritage and splendor. State of the art amenities and personalized services provided on board this luxury train aims to offer one of its kind luxury train tour in India. 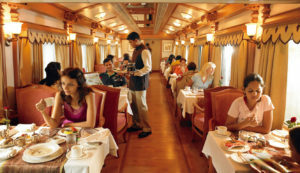 Facilities on board Golden Chariot are akin to a five star luxury hotel. An array of modern facilities have been provided in this luxury train which include plush cabins, multi cuisine restaurants, a nonchalant lounge, state of the art conference car and a rejuvenating health spa. Adding to the train facilities is the gracious services of staff that ever let you feel at home during 2 weeklong itineraries offered by this train. 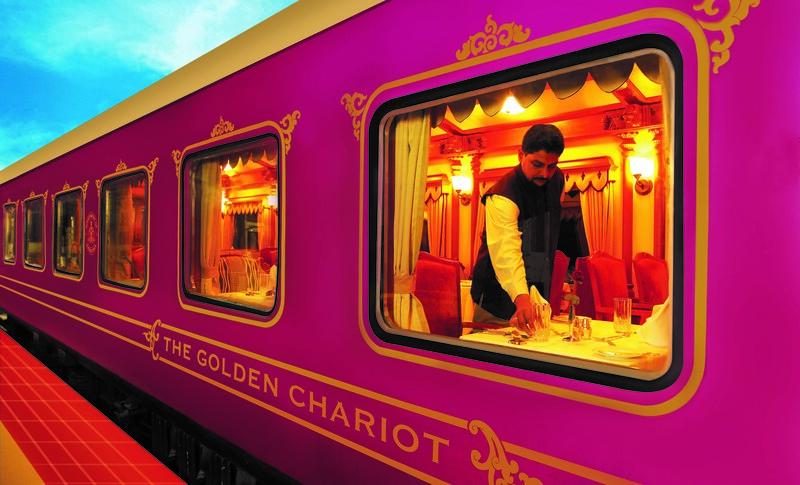 Owing to its world class facilities and refined hospitality, Golden Chariot has earned the recognition as one of the seven best luxury trains in the World . There are a total of 44 guest cabins which include 26 twin beds cabins, 17 double bed cabins and 1 disabled friendly cabin. Modern amenities housed within cabins include air conditioning, LCD television, wardrobes, writing desk, DVD player and attached bathroom among others. The Golden Chariot houses two multi cuisine restaurants – Nala and Ruchi, each of which draws inspiration from mythological texts. The tasteful décor of these restaurants is inspired from the architectural aesthetics of Halebid and Hampi. A delectable spread of fresh and aromatic vegetarian and non-vegetarian cuisines is served for the platter of the guests. The onsite lounge bar, Madira, literally meaning the mythical drink of the Gods is the best place to unwind after a tiring day of sightseeing. It houses a wide collection of exotic wines and spirits to lift up your weary souls. 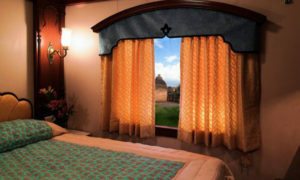 The décor of this lounge is simply elegant and exhibit the design aesthetics of Mysore Palace. Unwind your spirits as local artisans and lilting music add to the nonchalance of a languorous evening. The Conference Car housed within the Golden Chariot train allows corporate moguls to execute their business meetings in a regal way. With a seating capacity of 30 people, this conference car is well appointed with high tech facilities and audio visual equipments to facilitate the business endeavors of the guests. The modern day traveler expects his journey days to be relaxing and the Golden Chariot doesn’t disappoint on this front. The ‘Nirvana’ spa housed on board the train provides wellness solutions with traditional Ayurvedic massages that are truly appropriate for removing body ailments and balance your energy. The recreational coach also boasts of a fully equipped gymnasium where guests could work out and burn those extra calories. Indoor games including crossword puzzles, carom board, chess, Chinese checkers, playing cards and so on. Special assistance is available for differently abled guests in the form of wheelchair, crèches and attendants. A attendant, called Khidmatgar is always available at the guest’s service, to cater to all of their travel requirements. Wi-Fi facility along with Laptops is available on board to keep you connected with the world. Business meeting, Conferences and Royal Weddings can be arranged on board. Be informed on the go with daily news papers & magazines with your morning tea. Smoking in India is prohibited in all public places. Contact tour manager for more details. Sufficient safety arrangements are always made for the guests and their personal belongings in the train. Every guest is welcomed with a glass of wine & an arrival kit that includes stationery items, brochures etc. Medical assistance is available on-board the train. A doctor can be arranged on call at any destination. Each guest salon has a sitting lounge equipped with sofas, TV, DVD players and mazazines. The train has a Souvenir shop that sells handicraft items, traditional artefacts, curios and ethnic dresses. The attached bathrooms are equipped with showers, toilet & necessary toiletries. A well-equipped spa is available on-board that provides therapeutic massages & rejuvenating experience. Website describe the available services as of this date as accurately as possible. We reserve the absolute right to alter, amend, change or modify the tour package & itineraries (including but not limited to the cancellation and or substitution of guest speakers & signature departures). This may be necessitated due to factors beyond our control such as ‘force majeure’ events, strikes, fairs, festivals, sport events, weather conditions,disruptions/diversions of rail services, floods, earthquakes, traffic problems, overbooking of hotels / flights, cancellation / re-routing of flights or railway, closure of / restricted entry at a place of sightseeing and non availability of venues. Where we may know of these sufficiently in advance we will notify you, otherwise Train Manager would inform you of the changes during the tour. We or Golden Chariot would not be liable for any loss, cost, expenditure, damage or compensation for such changes. The itineraries on certain departures will run in the reverse direction. There may be a slight amendment in the activities and sequence of destinations visited. The right to vary, amend, alter or withdraw any particular itinerary, departure or excursion rests entirely with the Golden Chariot. If you wish to cancel the booking of your client, you must communicate the cancellation by E-mail to us.